Need more information about booking Property 3347190 ? Rustic tropical house at Porto de Cima Beach in Morro de Sao Paulo. Located just 5 minutes from the center of the village and surrounded by green forest with own land of 1700 m2. The monkeys come often to eat bananas from our hands. 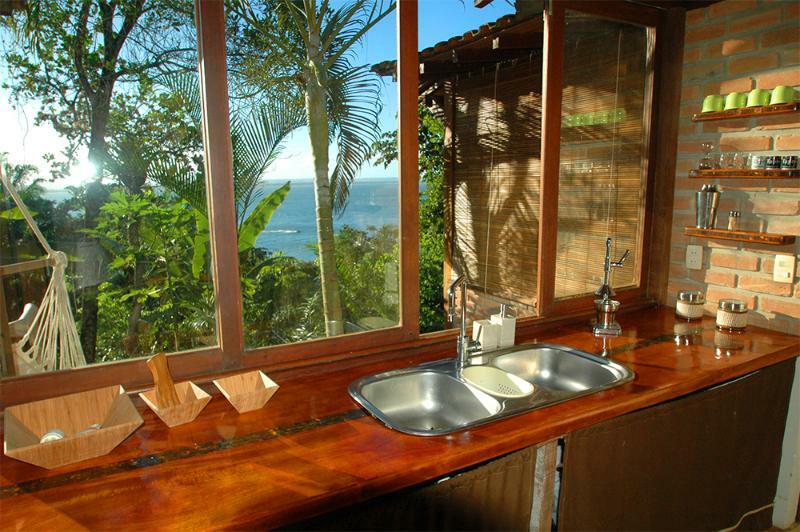 From all rooms you can see the ocean, even when your take a shower or cook. It sides north west and you see a spectacular sunset almost every day. My husband and I rented this beautiful house for a week in april 2014 and we were in paradise! The house is lovely and well equipped, in a peaceful side of Morro de São Paulo, but yet 8min walking distance from a mini market and a bakery. It has a beautiful view of the ocean and a nice deck where we would sip caipirinhas gazing at the starry sky. The house reminded us of a thai house. It has large glass windows with bamboo blinds and a beautiful wooden floor. We did not meet Leandro personally, but Esteban was very helpful and attentive. He left a cell phone with us in case we needed to reach him, and he called a couple of times to check on us. We really recommend this house. When I found this place I thought the pictures looked so gorgeous I didnt think it could possibly live up to my expectations, but it did... and more! I would definitely recommend this place and Leandro made it very easy, answering all questions quickly and helping us with travel advice - thanks Leandro! This is one of the most beautiful places I ever stayed at! Everything worked out perfectly, thank you Leandro for helping us so much. The house is perfectly equipped, has a wonderful view and is close to various beaches. We would like to come back and stay a little longer next time, just gorgeous! Leandro and his friends assisted us a lot with planning, picking us up from the harbor, showing us the house and even left a cell phone if we need anything. Just very hospitable and highly recommendable! Morro and the house are paradise-like places! We'd absolutly loved to stay there and are very sad we had to leave again. Unfortunatly we havent been able to meet Landro in person, but the email exchange and the preparation he did for us were very nice and perfect. And he gave us the feeling of 'always being there in case we need him'. On-site we had Esteban and andrea, who took care of us. And they did it in the best possible way. They were super nice and helped us out in every situation. Muito muito obrigada!!! The house is a place to relax and get your mind and soul some good rest. Everything is exactly the way it is decribes and shown on the pictures. We loved it here and hopefully will come back one day! Très agréable semaine avec deux enfants dans cette maison simple, à l'écart de l'agitation, avec une vue de rêve sur la mer. La plage se situe juste en bas de la maison, et la merveilleuse plage de Gamboa est accessible à pied en 45 minutes. Le tout à 10 mn des commerces. Leandro est un hôte très sympa, qui s'occupe de vous du début à la fin, et qui fait tout pour que votre séjour se passe dans les meilleures conditions. L'équipement est simple mais suffisant quand on est en vacances. Si vous venez à Morro, n'hésitez pas ! Incrivel, a casa é Maravilhosa, decoracao de extremo bom gosto e a vista da casa é sensacional! foram dias maravilhosos,as acomodacoes da casa superaram minhas expectativas e pretendo logo menos voltar! parabens pelo bom gosto leandro,recomendo de olhos fechados aquele pedacinho de paraiso! Morro es un paraiso a 2 horas de una ciudad increible como es Salvador, la casa es espectacular, esta totalmente equipada, lista para pasar unas increibles vacaciones. Se nota el muy buen gusto del dueño, todo esta pronto para disfrutar, no hay que preocuparse de nada, es un lugar excelente para desestresarse y estar en contacto directo con la naturaleza. En resumen la casa supero totalmente nuestras espectativas, es genial! 100% recomendable. Muy hermoso lugar para los amantes de la naturaleza, los pájaros de colores y los monitos viene a comer de la mano en el deck. La casa parece tailandesa, muy linda,con vista al mar y dentro del ambiente como una continuación natural. Y a la vez, todo muy cerca, negocios y restaurantes, así como otras playas, además de la que hay bajo la casa. Bien acondicionada. Amé ese lugar. You can get in touch with Leandro (the owner) through the contact form on this page. Send Leandro (the owner) an email through the contact form on this page. Alternatively, if there’s a phone number on this page, you can call them. How do I contact Leandro (the owner)? If you’ve already booked, go to Manage your booking to view Leandro the owner's contact details or send them a message. Or send Leandro (the owner) an inquiry through the Contact the owner/manager form if you’d like a quote or more info first. When you pay online through the Ready to book? form, a booking request is sent to Leandro (the owner). You’ll find out within 24 hours whether they’ve accepted - no money will leave your account before then. You can also request a quote from Leandro (the owner) through the contact form. The owner will email you the total cost for your dates and a link to book and pay online. Use the Ready to book? form to pay provisionally online. You can pay by credit/debit card or PayPal. Leandro (the owner) will have 24 hours to accept the booking and no money will leave your account before then. Why can't I call Leandro (the owner) before booking? You’ll need to contact Leandro (the owner) to do this. Send them a message in Manage your booking or through the contact form on this page. You can request to change the dates or number of people on your booking via the Manage your booking page. To change your dates use the Edit booking button. If you need to change the number of guests staying then send Leandro (the owner) a message. If Leandro (the owner) agrees, they’ll send you a revised quote outlining the changes. You can review and accept/decline this from the Manage your booking page. You’ll have 48 hours to take action before the revised quote expires.